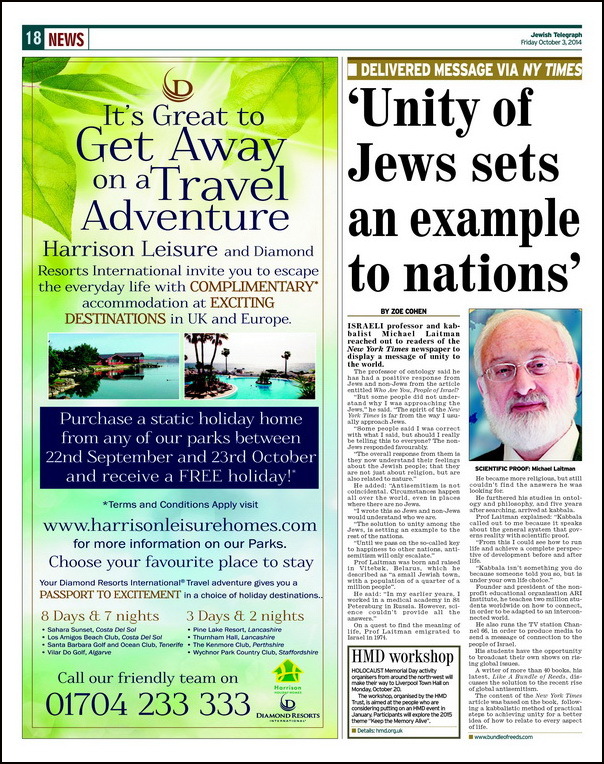 “Israeli professor and kabbalist Michael Laitman reached out to readers of The New York Times newspaper to display a message of unity to the world. ‘But some people did not understand why I was approaching the Jews,’ he said. ‘The spirit of The New York Times is far from the way I usually approach Jews. ‘Some people said I was correct with what I said, but should I really be telling this to everyone? The non- Jews responded favourably. He added: ‘Antisemitism is not coincidental. Circumstances happen all over the world, even in places where there are no Jews. ‘I wrote this so Jews and non-Jews would understand who we are. 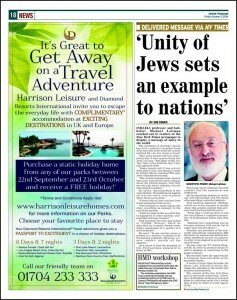 ‘The solution to unity among the Jews, is setting an example to the rest of the nations. Prof Laitman was born and raised in Vitebsk, Belarus, which he described as ‘a small Jewish town, with a population of a quarter of a million people”. He became more religious, but still wouldn’t find the answers he was looking for. Prof Laitman explained: ‘Kabbala called out to me because it speaks about the general system that governs reality with scientific proof. ‘From this I could see how to run life and achieve a complete perspective of development before and after life. Question: For years we have been studying Kabbalah; we understand our path, strive to the property of bestowal. But at the last moment, fear arises about how to combine reception and bestowal, i.e., fear before the property of bestowal. I understand that it should be done not for myself but only for the sake of the Creator. How can we not be afraid of that? Answer: Who gives you these feelings? Who controls your feelings and your mind? Who is inside you and causes you to have these perceptions? The Creator. So, talk to Him as He tightens the control in you, and sets up your sensual and thinking apparatus for a certain excitement. For what reason is He doing this? If you begin to connect with His work and begin to explore what He causes in you and for what purpose. you will begin to feel the Creator and yourself as partners. After all, He produces everything, not in you, but in your so-called desire, which He also created and upon which He is now working, causing certain disturbances within it. According to these disturbances, you have to find the correct answer of what you would like Him to do. Or, you agree that He does anything He desires, but teaches you how to relate to Him correctly. Start looking for the right dialogue with the Creator. However, if you start doing this and do not take it through the group, it will not be the Creator, but only your psychological, emotional and mental conclusions. The Creator is within the group of ten. This is the problem of all the psychologists and other researchers who cannot understand where He hides. Question: You said that the desire for the property of bestowal is manifested for a moment, and then we lose it, again feel for a moment, and lose it again. In order to feel our unity, should we wish this all together in one second? Answer: A short-term collective desire will not help us. We need to accumulate a certain potential for a certain time so that our tension is correct. This is called “the world, the year, the soul” (Olam, Shana, Nefesh). That is, in spite of all the transformation that we are experiencing, if we direct this correctly towards the goal, unite, find the upper point between us, and adhere to it, then we gradually accumulate the required tension and the revelation of the Creator takes place. In the News (from Slon): “Only five percent of the vote separated Scotland from independence; meaning, that almost half the population wants to secede from the United Kingdom. “The right-wing party in Sweden has doubled the number of seats in the parliament: the economy is growing, but the standard of living – not; the standard of living of the middle class around the world after the crisis of 2008 has fallen. “Society intuitively feels that the welfare of the rich multiplies, and middle-class income decreases. As a consequence, nationalist sentiments are growing around the world. The right-wing parties have become the leading parties in Poland, Spain, Germany, Bulgaria and Lithuania. In Ukraine, national independence is on the rise. In Spain, the Catalan separatists were granted the power to call a secession referendum. “All the efforts of politicians of the 21st century, aimed at political and economic alliances, can be broken against a simple ordinary person’s question: why is my life not getting better? Separatist sentiments and the growing influence of the ultra-right is just the beginning of the crisis of the world order. My Comment: The solution is only in achieving a reasonable standard of living, moreover, one equal for everyone. This is possible only after active integral education and upbringing for everyone. Humanity must become different: unified and global. Otherwise, it will not survive in our present limited planetary conditions. Excuses like “there is enough for our lifetime” are not correct, because the crisis breaks out much earlier than resources run out and begins to emerge from the incongruity between humankind and the new future conditions that are automatically supported in the still, vegetative, and animate levels of nature. According to Kabbalah, we are more than a hundred years behind in our development relative to our next state. Question: How should we relate to the expressions of anti-Semitism more correctly? Should we continue to ignore its growth in the US and hope that it will go away by itself, or will it grow to such an extent that later it will be too late? Answer: Nothing will go away by itself because the anti-Semites are right. Listen to what they say: The Jews are responsible for all the problems in the world. They feel that they depend on us. How would you relate to people who cause you harm and that you depend on? We, on the other hand, don’t do that but show the world the opposite, how it is possible to get along better in life egoistically. Unless we connect and become a good example for the nations of the world, the world’s attitude towards us will not change for the better. It will constantly get worse to the extent that the world becomes increasingly more global and mutually connected on the one hand, and torn internally by the ego, on the other. Thus the tension is constantly growing as nature closes in on us by connecting us from the outside while on the inside we are torn apart, repulsed by each other. In this state, the wisdom of Kabbalah, which means not only the idea but also the practical experience of our right connection and unity, is the medicine for the whole world without which the world will not survive. If we don’t start to connect and unite properly, we will reach a third world war and great sufferings, which are mentioned in the writings of Kabbalists. They also tell us how we can unite in a quick and proper way. It is very easy to practice and this will immediately be reflected in the nations of the world. If we want the nations of the world to change their attitude towards us, and as it says in Isaiah “to admire us,” it is possible only if we give them the right example of mutual cooperation among all of humanity, an example of the order in the world, so that there will be total mutual dependence. Question: The word “Pur” (fate) appears in Yom Kippur (Day of Atonement) and also in Purim, which symbolizes the end of correction. Why does this term appear in both words? It is a state in which I don’t count on my own strength and advance blindly, relying totally on the next level, on the Light, on the Creator who guides me. We can only ascend the spiritual levels and reach the state of Kippur, Pur, and Purim if we advance in faith above reason. This is the only way it works. Answer: The word “donkey” (Hamor) stems from the Hebrew word “matter” (Homer). Working in a group of ten, you will see that of these ten donkeys (matters), you are the lowest. Malchut and all the other nine Sefirot are higher, pure categories of bestowal. You are the only uncorrected egoist. You will discover that the matter of all the nine donkeys is actually concentrated in you. This means that you are the greatest donkey with a huge ego and all the others before you are not people but angels, the category of love and bestowal. You will understand that no one in the world needs to be corrected but you, and that all the others are totally connected to the Creator! Only you alone are the uncorrected part of creation. You should look more closely and you will discover it. Question: The annual cycle of the Jewish holidays symbolizes the series of states through which a person passes on his way toward connection and unification, and this is the goal of the evolution of the entire human species. Every holiday represents a particular stage on the way toward unification. Why does this entire cycle finish in the month of Elul where we summarize the results of what we went through and attained, and judge ourselves? Answer: Israel means Yashar-El (Straight to God), meaning a desire directed straight toward the higher force of nature. The Creator is nature, and, so, what is being spoken about here is our balance with nature. There was a time when Abraham discovered that this is precisely the goal of human evolution that we must reach. That group of students that he gathered around him in ancient Babylon and brought to the land of Canaan eventually became the people of Israel. This was a community of people that defined the attainment of equivalence of form with the higher power as the goal. The higher power of nature is the power of bestowal and love. This is what Abraham taught those Babylonians who followed him: love of one another, bestowal, and benevolence. Benevolence is the original and primordial characteristic of Abraham. During his investigations, Abraham discovered the goal of the existence of the human species, which is to reveal the love between all people or, at least at first, among some of them. Thanks to relationships like these, they attained similarities between them: equality and conformity to nature, to its inner power called the Creator. Nature is based upon a single force that connects all parts of creation together, these being the parts of the still, vegetative, animate, and speaking. All of them are included in a single system that connects all of the elements together in general harmony and working together. Just like a working cell of our body inside which there is a whole world, a countless number of mutually connected elements—like genes, bacteria, and whatever might be there—but everything is found in a general harmony. If there is no harmony, then this is a disease. All of nature is like a cell; it is a single, closed, integral, global system, and is absolutely connected. There are no parts in it that could operate independently of the others and develop separately from them. All development is mutually connected and precisely defined. Lately, science is discovering how much we lack free choice and that everything is determined by genes, hormones, and combinations of chemicals and various bacteria. What I will do depends only upon this—which decisions I will accept, to whom I will be attracted, and who I will avoid. We naively think that we have free choice, yet we don’t. We only obediently carry out the commands of nature. A person is found within nature, and all of his development is determined through a combination of the internal forces within him. He also obeys and blindly follows his instincts like animals. By what means is a person ready to influence his development? First of all, we must understand that nature has only one law, and it is general unity. This law connects together the parts of nature into a single system, except for one part, which is the human being. Humanity, ultimately must also reach that same connection and attain balance with all the parts of nature. Yet this is as a result of blows and pressure through suffering and troubles during thousands of years of evolution. This has cost us a multitude of suffering and pain. This means that feelings and intelligence are discovered in us at such a level that we begin to think and wonder about the reason for our endless torment. For what are we compelled to suffer? What useful conclusions can be derived from these sufferings? Who enjoys our life? To whom can we give pleasure? These questions pop up in our minds and hearts by themselves. From the blows and the pain, we begin to ask, “What does this mean?” We already have gone through the first and second world wars. How much more is it possible to endure? Today, the world is found on the threshold of a third world war. We already have discussed this quite openly. This is a life under the conditions of terror. There are terrible problems, a feeling of powerlessness. Half of the world throws surplus products in the trash, whereas the other half is dying of starvation. The humanity of today possesses such immense powers and possibilities, but look at what we do with these immense abilities and potential. All of these questions are awakened in us, and call for a search and investigation of the cause for suffering. They are awakened as a result of the unique illumination of the understanding in our heart and mind that is called Elul. The word “Elul “is an acronym for “I am my beloved’s, and my beloved is mine,” Ani Ledodi Vedodi Li, (Song of Songs 6:3). “My beloved” is that immense system of nature that develops us. We receive a special sign from it, experience unique feelings and mental insight that makes it possible for us to understand what the system of nature wants from us, what it is thinking about, and what it demands. The entire general system of creation is called the Creator, or nature, which is the same thing. The external environment can affect the development of inclinations. The human being loses human shape faster than a domesticated animal become wild. Egoism – is our software. The term “human being” has no relation to our animal body. It is difficult for the human being to “escape” himself while in contact with others. Question: Children in the Diaspora usually go to Jewish schools called Hebrew school. These are special schools that are open on Sunday, where children learn Hebrew, Jewish history, and Jewish customs. Let’s try to imagine a school where unity is taught. What should it look like? What will happen there? Answer: People learn there by connection, by playing connection games and by having discussions in circles. Of course, children also engage in physical activities like games with balls, etc., but they don’t play against each other, only together. We must develop games that are not based on competition between individuals and between teams. Instead, a person has to compete against himself in order to properly be incorporated within the common activity and to see himself as his own competitor. This doesn’t apply only to children, because the parents also have a problem. They must be taught the principles of family life and how to impart to their children a general, integral attitude towards that world. The relevant issues should be discussed in circles where everyone connects and then the discussion should be continued and expanded at home. Question: Is this what will make a child Jewish? Answer: Of course, since a Jew is someone who yearns for unity and connection with everyone. A Jew is someone who knows that his role in life is to be a Light unto the nations and to bring correction to the world through connection. This is especially true in our times, in the time of the global crisis when there is no other remedy but the connection between all the parts of reality, in perfect harmony, in one circle. Generally speaking, it isn’t about a Jewish school, but about a social community school where the whole family comes to practice connection. When they perform these exercises, they feel that suddenly a certain power surrounds them and changes their perception of reality so that the world seems different. Connections and relationships begin to change internally under the effect of the force of the unity that is invoked by the Light, and it raises people to a new level of understanding. They begin to see the world as they have never seen it before, as if they wearing glasses that brings into focus the fogginess and blurriness of their nearsightedness, and they become as one connected picture, stretches into the distance. This is exactly the feeling that both children and adults will feel, starting from their very first workshop. Question: Will this connection help overcome the gaps between them? Answer: The connection will not only help, but will also solve all problems. The connection gives us power, not in order to overcome hardships and to win, since when we are united, there is no one to defeat. The unity between us does all the work and drives away all our enemies, all the interferences, illnesses, and problems, everything that comes from self love. At the same time, there is no need to give up our opinions and our beliefs, but only to add our exertion in order to connect with the whole nation, with all of Israel; that’s all. This is what the Torah and current research of connection the wisdom of the crowd tell us. The Israeli nation must be the first to connect. Otherwise the force of connection will not be able to go through it to the nations of the world. Question: Why is it the Israeli nation that has to pave this path? Answer: Not everyone agrees that we are special, but history proves it is so. We are special because the whole world depends on us. Although this connection is invisible for the time being, the nations of the world do feel it. There are those who believe that their lives would be much better without us, but there are others who know that we need to change and that this change will be for the benefit of the world.